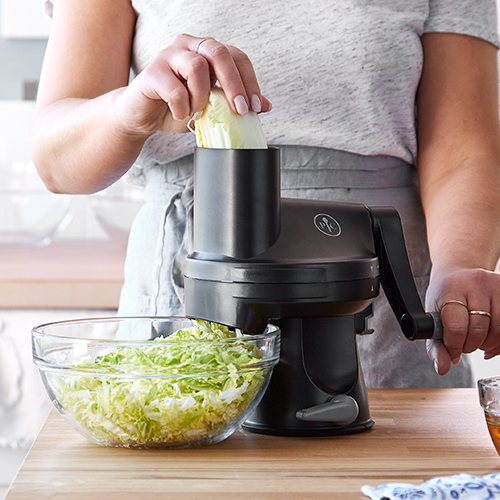 No et moi: What’s with the kitchen gadgets? Here’s an odd little detail from No et moi, Delphine de Vigan’s novel about a thirteen-year-old genius who befriends an older homeless girl. Towards the end of the novel, Lou (the thirteen-year-old) is feeling overwhelmed by the situation. A few weeks earlier, the story almost seemed to have reached a happy ending, with No installed in Lou’s family home, happy, sober and in employment, and Lou’s mother lifted out of the long depression caused by the death of Lou’s baby sister Thaïs by the experience of helping No put her life back on the rails. Now, though, all of this has fallen apart. No’s drinking and pill-stealing have seen her thrown out of Lou’s home, and Lou has reason to believe that the temporary refuge she has found with Lucas is now under threat. Lou’s own secret crush on Lucas is running up against the harsh reality of their four-year age difference, and she is filled with jealousy at his attention to other girls his age. When No gives Lou an expensive thank you gift, Lou is struck by the contrast between the bleakness of No’s situation and the fake glamour of the perfume advertisement on a poster that forms the backdrop to the scene. Depuis que Thaïs est morte maman m’aime plus. Lou, tu te trompes. Maman t’aime, elle t’aime de tout son cœur, elle ne sait plus très bien comment faire, pour le montrer, c’est un peu comme si elle avait perdu l’habitude, comme si elle se réveillait d’un long sommeil, mais dans ses rêves elle pensait à toi, beaucoup, et c’est pour ça qu’elle s’est réveillée. Lou says ‘d’accord’ to show she’s understood him, and even smiles. But inwardly, she’s thinking… what? J’ai pensé aux vendeurs devant les Galeries Lafayette, perchés sur leurs petits stands, ceux qui font des démonstrations avec des machines incroyables qui découpent les trucs en cubes, en tranches, en rondelles, en lamelles, en roses des vents, qui râpent, pressent, broient, mixent, bref qui font absolument tout et qui durent toute la vie. N’empêche que moi je ne suis pas tombée du dernier RER. And there the chapter ends. What does it mean? Galeries Lafayette is a deluxe department store in Paris, and these salespeople are in the street outside it. (Do they work for the department store, or are they just hoping for a little reflected glory on the product they’re selling?) The kitchen gadget they’re demonstrating is a kind of miracle all-in-one food preparation device that can dice, slice, grind, mix and do all of the other things listed above, plus more besides, and which will never break down as long as you live. Or at least, that’s what they claim. Lou’s comment on this loosely translates as ‘Even so, I didn’t fall off the last RER’, the RER being the Paris crossrail linking the suburbs to the city centre. Even if you don’t spot the similarity to the more usual French expression, ‘je ne suis pas tombée de la dernière pluie’, you can probably guess from the context that this is Lou’s urban version of the expression meaning ‘I wasn’t born yesterday’. With that, things start to become clear. The gadgets are just too perfect: they do everything, you can rely on them for ever. Clearly, the salespeople are lying, and the thing will spend a couple of weeks grinding when it’s supposed to grate and slicing when it’s supposed to dice before breaking down completely and spending the rest of its life at the back of a cupboard. If the kitchen gadgets are a symbol, then, they must symbolize the idea that Lou’s father’s reassurance is also a lie, that the picture he paints of a mother who loves her daughter dearly but just needs a little more time to recover from her depression is also too perfect to be true. Lou has witnessed how No managed to bring her mother out of her shell, make her smile again and engage with the world, in a way that Lou herself has never been able to. Earlier, Lou was left ‘très en colère’ (on p. 157) when her mother shared a bottle of wine with No and opened up to her about Thaïs in a way she never had with Lou. So Lou is jealous of her mother’s relationship with No, and resentful that her mother hasn’t shown so much closeness to her for years. It’s never clearly expressed, but we can also speculate about what may lie beneath these feelings: is Lou secretly afraid that her mother would rather that she, Lou, had died and Thaïs had lived? And if so, is she right to be afraid of that? We’re left to make up our own minds about these questions. My own view is that Lou’s father is largely right: Lou’s mother has behaved like she has because she has been suffering from depression, not because she does not love her daughter. Lou’s sceptical thoughts about food-processors tell us more about her own (understandable) feelings of insecurity, than they do about her mother’s true attitude towards her. You may read it differently. However you interpret it, though, it definitely forms a part of the novel’s deeper story about how Lou slowly comes to understand that in real life there are no fairy-tale happy endings, and that broken people cannot be easily fixed. A brilliant book and an excellent post. I will certainly be sharing you thoughts with my Year 12 class. Merci! Delighted you have chosen this novel to comment on this week… just about to introduce it as the yr 13 novel for A level French! More posts on “No et moi ” would be very welcome – I have also just started to introduce it with current Yr 12 for study in Yr13. I agree with Jenny . More More posts on “No et moi ” would be very welcome as I love the book.